This 3-novella romance bundle features one Christmas season in the small town of Westen, Ohio. 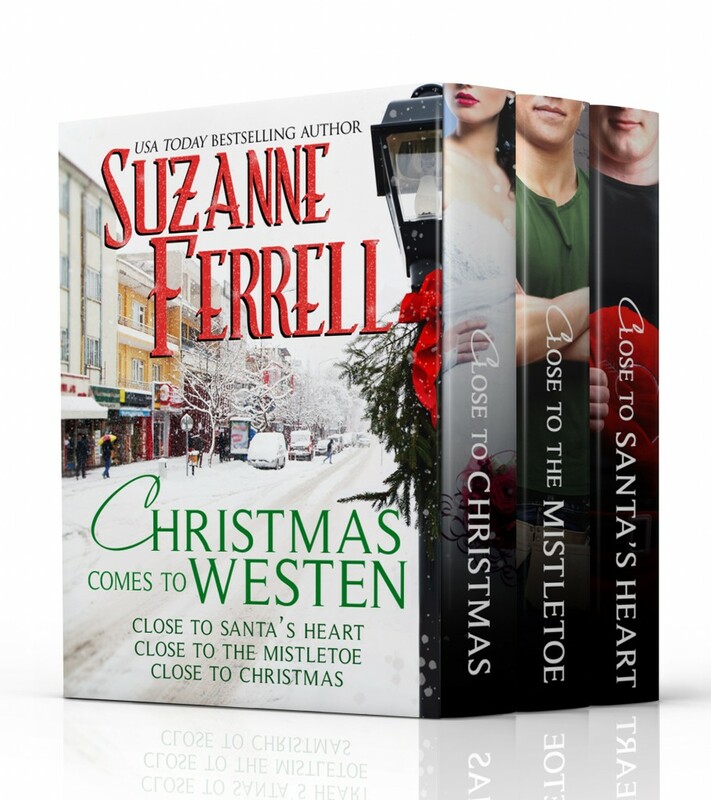 Starting with Close To Santa’s Heart, through Close To The Mistletoe and ending in Close To Christmas, the characters of Westen will show you how one small town comes together to celebrate the holidays with laughter, love and a dose or two or suspense. As Westen’s resident Santa, Deputy Cleetus Junkins brings the magic of Christmas to his beloved home town each year. He oversees lighting the tree in the square and raising the huge mistletoe kissing bough in the gazebo. At the parties he visits with children and the elderly. Amid all this joy even Santa can be lonely. Or he used to be. This year, Cleetus has a helper. Sylvie Gillis came to Westen for a fresh start only to have her heart immediately melted by a shy gentle giant of a deputy. Her childhood was short on happiness but playing elf to Cleetus’ Santa makes her want to believe in Christmas miracles. As Cleetus and Sylvie help bring Christmas joy to the citizens of Westen, the holiday magic weaves its way into their hearts. Will the reason Sylvie left home come between them or can she stay Close To Santa’s Heart? When teacher Holly Murphy walks into Westen’s only bar to help her friend celebrate a divorce, she doesn’t expect hot carpenter Nick Fisher to save her from an embarrassing situation. His heated kisses awaken something deep inside her, but when someone sets his sights on Holly, will Nick be the one to protect her close to the mistletoe? It’s been a long dangerous year for the town folks of Westen. A celebration is just what they need. It’s four days before Christmas and the town is not only decked out in their holiday best, but looking forward to the wedding of Sheriff Gage Justice and his love, Deputy Bobby Roberts. First Bobby’s lawyer sister, Chloe comes to town looking over her shoulder, which has the quiet deputy, Wes Strong wondering what has her running scared. Then problems start to happen with the wedding plans. Has Chloe brought trouble to Westen? Or does someone in town want to ruin the wedding this close to Christmas?